Mars Open review — Golf Jim, but not as you know it! 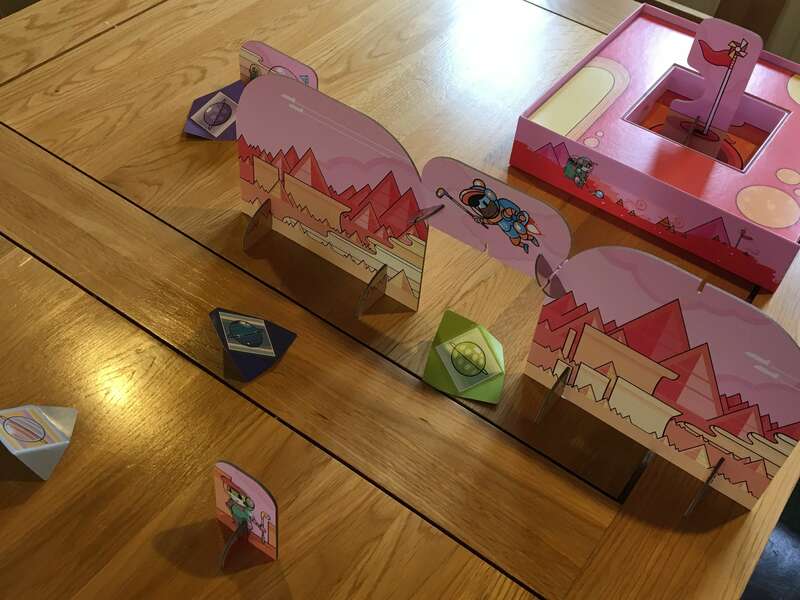 Mars Open is a recently Kickstarted game of tabletop golf set on a loose, and Jetsons-esque, interpretation of the surface of Mars. Players each use their fingers to pin and flick specifically folded pieces of card that represent their ball, tracking how many flicks it takes them to reach the hole. Mars Open is a dexterity game first and foremost, but unlike many games in this genre, it rewards practice and experience rather than natural agility. In principal, the combination of golf and a dexterity game could not be worse for me, since I am absolutely awful at both, usually. It’s not that I hate either (I’m too old for such strong emotions nowadays) but the last time I went out on the links I hit well over a hundred balls and gave it up as a bad job. At home, dexterity games tend to be unfavourable for someone like me who has poor hand to eye coordination and very little patience. I could only hope that Mars Open was a more forgiving kind of dexterity game. The concept could not be more straightforward, if nothing else. There are something like sixty pre-designed holes to choose from, including a number of specific nine and eighteen hole courses that players can work through to determine an overall winner. 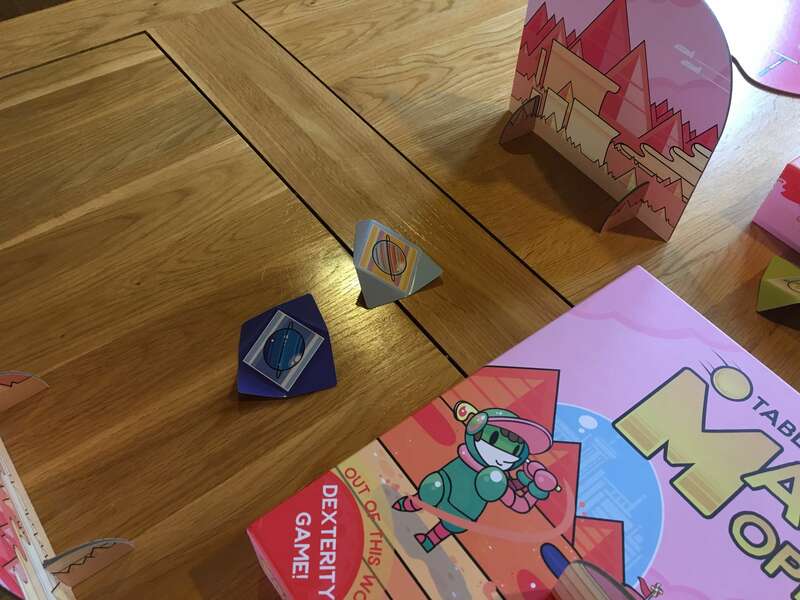 Mars Open supports up to eight players, each of whom will receive an oddly shaped square of cardboard with four folded fins on it. 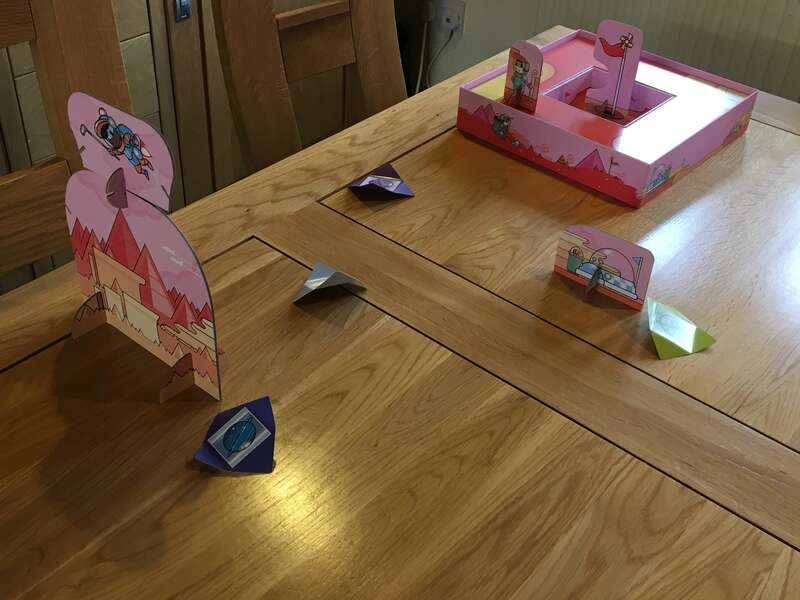 Their objective will be to get those squares from the tee (represented by one of several simple cardboard props) to the hole, which is contained in the bottom half of the game box. As with a real game of golf, the lowest number of shots in Mars Open will win the hole, with players tracking their cumulative totals across the entire game. At the end of the agreed number of holes, the player with the lowest number of shots will win the whole round. Mars Open also simulates real golf by allowing whoever is furthest from the hole to take their shot next (even if that was the player who just hit one) and the game feels reasonably authentic – it may feature cartoon-inspired visuals, but Mars Open steers clear of bonus points, accumulators and other potentially complicated scoring connotations. That’s not to say that there’s no skill involved in Mars Open though, because actually the manual is packed full of different ways to hit the “balls” in order to apply spin, curve or fade, as well as to keep shots low or send them high. Most of these are achieved by pinning one of the folded flat corners gently with one hand, then launching the ball with your other – doing these kind of shots will takes a lot of practice, to say the least. It’s a good thing that some pointers are provided as well, since the holes become increasingly more fiendish over time. When I initially punched Mars Open, I was surprised by how few components there were, but what it lacks in volume it more than makes up for with creativity and inventiveness. Later courses are fiendishly difficult to achieve par or less on and if competitive players decide that they want to add their own variants like hole-in-one challenges, then the game can certainly accommodate that. As I’ve just mentioned, the list of components in Mars Open may come across as surprisingly few in number, but the instruction manual offers a huge number of clearly laid out holes for players to experiment with, all of which reuse the simple, robust components in different ways to create a lot of variety. Both the base of the box and its lid will be used in some courses and it’s fair to say that there is literally nothing about Mars Open that is left aside. Likewise, there is no unnecessary fluff in the box — it’s all pleasingly matter of fact. There are, of course, eight of the little square balls (each with a different symbol on them) and eight matching markers, just in case you need to remove your ball to leave room for another player to take their shot. After that, there are a couple of stand up barriers that depict the pink-hued hills of the Martian terrain. There’s a smaller hump too and the equivalent of a sand trap, plus a cardboard standee of another golfer who is often clipped to other pieces of scenery using push-in cardboard connectors. The base of the box is perhaps the showiest thing here, since it has a whole cardboard frame within it that houses the hole at its centre. A standee of a flag sits proudly within this hole, waiting to be lifted out when a player feels confident enough to try and hit their shot home. There are a few other bits, but aside from a manual (which is clear to use and as I’ve already mentioned, packed full of course ideas) that’s the main components covered. All of the artwork in Mars Open reminds me of shows like The Jetsons because of its cartoonish look, but it’s all very nicely done and if nothing else, it gives the game a gentle, fun kind of vibe. The quality of components (mainly the thickness of the card and how well it stands up to being rearranged multiple times) seems high based on the probably fifty or sixty holes that I’ve played so far, although some edges are now showing a bit of understandable wear. Whilst I went into Mars Open feeling fairly sure that I’d hate it, I have to admit that I was wrong. Perhaps it’s because golf in reality is actually much harder (and more to the point, more embarrassing to be bad at) or perhaps it’s because Mars Open is quite a cerebral dexterity game, rather than a reaction based one. Whatever the reason, the more I played it, the more I liked it — though you’ll need to accept that the learning curve is very, very steep and potentially frustrating. Played as a light party game that (broadly speaking) everyone is happy to be bad at, Mars Open offers some laughs, some fun and a reasonable way to kill some time either before or after whatever your intended main event is. Look at it differently though and invest some time into it and Mars Open can become surprisingly competitive between players that know what they are doing and have had a bit of practice. I find it especially fun to play with real life golfers, who initially deny that reference to real golfing skill is valid, but soon change their tune once the competition heats up — especially if they are winning. Mars Open is also good with kids. It’s incredibly quick to setup and tear down and you can kind of play it for as short or as long a time as you like. Sure, you should play nine or eighteen holes, but if you lose your audience after two or three, it’s no big deal because you can have it packed up in just a few minutes. 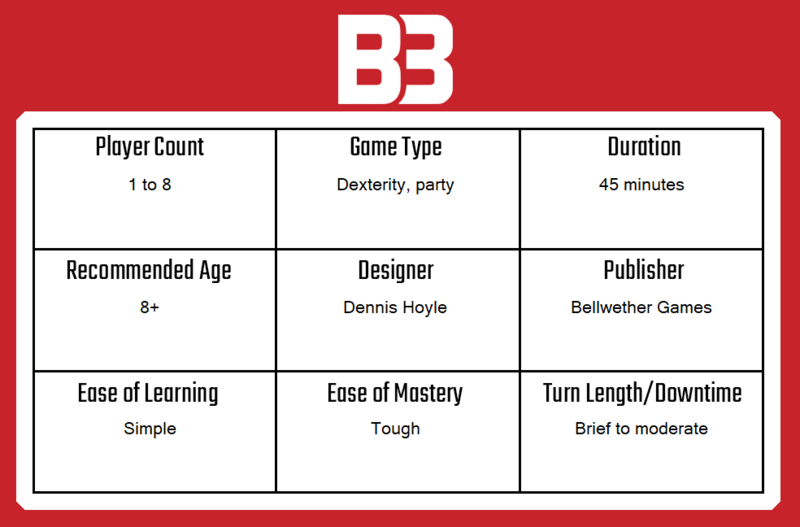 I’ve played it with kids from about six years old through to thirteen or fourteen (after which I guess they are kids no more) and most have enjoyed it for at least fifteen or twenty minutes, with some sticking out the whole game quite happily. Mars Open is a pretty unique addition to my collection and so I am tempted to suggest that it will keep being played. I don’t have many dexterity games (since I don’t like them) and even if I did, I don’t think this falls into the same kind of rut as most of the ones I have played. It’s certainly a unique experience that has a lot of replay value and versatility, whether you aim to master it or simply treat it as a casual experience. As such, Mars Open gets a strong recommendation from me. A copy of Mars Open was provided for review purposes. You can find out more about it on the website of publisher Bellwether Games.